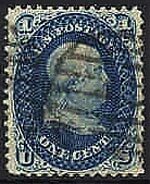 PART 1 of a combination auction that consisted of a pair of Scott 63, which is shown to the left. Sold on 13 Mar 2002 to "chickfrdstk"
It should also be noted that "schuylerac" calls this item a 63a, which is a colour variation. IT HAS SMALL FAULTS BUT LOOKS DECENT---PLEASE READ THE FOLLOWING. IT REMAINS CONSTANT FOR ALL LOTS LISTED. YOU ONLY NEED TO READ IT ONCE. SEE THE PHOTO FOR THE CENTERING AND MARGIN SIZE. FOR THE CONDITION OF THE PERFORATIONS. FOR THE CANCEL TYPE AND DEGREE. FOR THE SHADE OR SHADE VARIATION(THIS IS VERY SUBJECTIVE TO PERSONAL OPINION). VIEW THE PHOTO AND BE YOUR OWN JUDGE TO MEET YOUR OWN PERSONAL CONDITION REQUIREMENTS AND PERCEPTIONS. 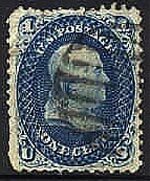 PART 2 of a combination auction that consisted of a pair of Scott 63, which is shown to the left. Reperfed at the top edge and the right edge. The right edge was originally a straight edge. It should also be noted that "schuylerac" calls this item a 63b, which is a colour variation. FRESH AND CLEAN, WELL CENTERED, SOME PERFS IMPROVED!!! PLEASE READ THE FOLLOWING. IT REMAINS CONSTANT FOR ALL LOTS LISTED. YOU ONLY NEED TO READ IT ONCE. SEE THE PHOTO FOR THE CENTERING AND MARGIN SIZE. FOR THE CONDITION OF THE PERFORATIONS. FOR THE CANCEL TYPE AND DEGREE. FOR THE SHADE OR SHADE VARIATION(THIS IS VERY SUBJECTIVE TO PERSONAL OPINION). VIEW THE PHOTO AND BE YOUR OWN JUDGE TO MEET YOUR OWN PERSONAL CONDITION REQUIREMENTS AND PERCEPTIONS.